This girly celebration cake is bound to make anyone smile! 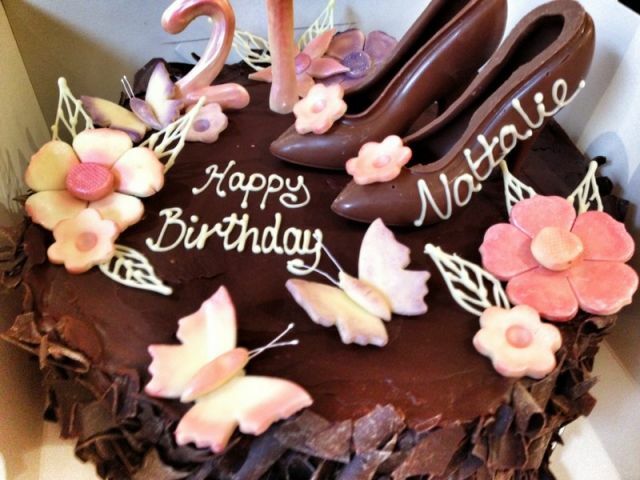 It is decorated with a gorgeous pair of chocolate high heeled shoes, white chocolate butterflies and flowers coloured in dainty pinks and purples, with hand piped chocolate leaves to add texture. Choose from a vanilla or chocolate sponge and milk, white or dark chocolate ganache for the filling and topping. Fill in the message boz below to personalize your cake to make it extra special!